Since 1814, the Star Spangled Banner has been our anthem and our song for inspiration and emotion. When done right, the national anthem will give you goosebumps and choke you up. We have narrowed down the top renditions of our national anthem and selected the 10 best performances of all time that we feel have earned their place in history. The powerful voice of Jim Cornelison combined with the raw emotion from the 10-year anniversary of the 9/11 will bring every last ounce of patriotic spirit out in you. We encourage you to pump your fist and sing along with this one! We will never forget. This version of the Star Spangled Banner is an amazing tribute to those we lost on the tragic events of 9/11 and was an important reminder for us to come together as a nation. The Air Force Academy, Coast Guard Academy and the Naval Academy set aside their differences and put on a impeccable performance of the Star Spangled Banner. The look on the Kentucky basketball player’s faces says it all! This 16 year-old phoneme will leave you in awe. Lady Gaga like you have never seen her before. A timeless and beautiful voice that will give you goosebumps. The fly-over will seal the deal! Fist pumps and shouting should be required after nailing the National Anthem like this! Faith Hill, well…she earned the right to give two fist pumps! Raw emotion and solidarity. This rendition after the Boston Marathon bombings will bring you to tears. Plain and simple, Demi Lovato leaves her heart on the field before Game 4 of the World Series with this rendition. Spot #3, earned! This is just ridiculous! If you are 10-years-old and your performance loses out to only Whitney Houston..well enough said! Whitney Houston’s memorable classic takes the number one spot. No other words than, “number one”. 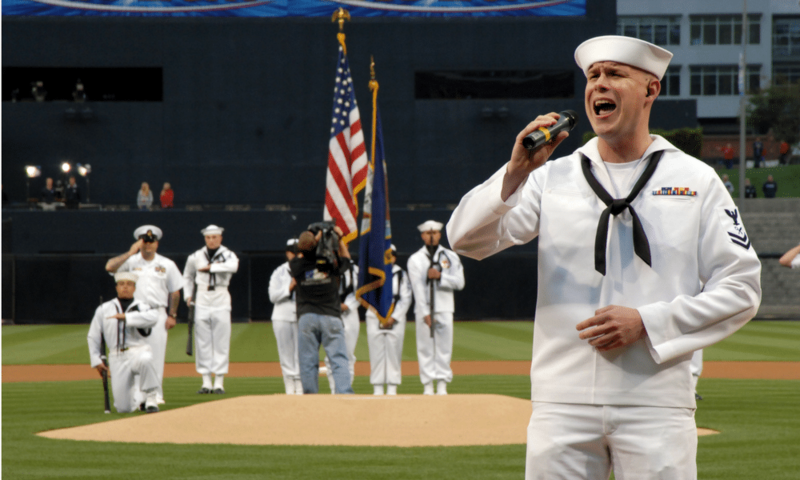 We would like to hear your thoughts on our top 10 list of National Anthem performances. Did we get it right? Whose performance should we have included. Please leave your comments below! Don’t forget to share this post with a friend who would appreciate it!